TOKYO, Mar, 22 2019 - (JCN Newswire) - Hitachi, Ltd. (TSE: 6501) and the German Research Center for Artificial Intelligence GmbH (DFKI) jointly developed an AI based technology for quantifying physical load on a worker wearing a sensor suit(1) and for providing effective feedbacks on the movement of each body part. This AI technology performs real-time recognition and quantification of physical load exerted on a worker's body during work by using the motion data of each body part obtained through sensors in wearable devices. This technology makes it possible to provide effective feedback to workers on their differences from the model worker in the movement of each body part. DFKI and Hitachi will use this newly developed AI technology to assist operations and prevent dangerous actions, thereby contributing to ensuring safety, managing health, and improving efficiency on the front line of manufacturing. In a society in which skilled labor is in shortage and recruiting new workers is becoming increasingly difficult, maintaining the skill level of workers is becoming difficult in manufacturing industry (e.g. car factories) and in maintenance or carrier businesses. As conscious of ensuring the safety and health of workers in production sites has been increasing, assisting workers in preventing danger and maintaining health is considered very important. To keep workers safe and healthy, it is necessary to know the level of physical load during work. In conventional approaches, fixed cameras are used to recognize workers' activities. However, since cameras are limited in the range they can measure, it has been difficult to quantitatively and stably assess physical load in complex production sites or outside places where it is hard to eliminate blind spots. Sensors in wearable devices directly measure the movements of over 30 body parts necessary to recognize basic human actions. The collected data is analyzed by AI driven models which learned how to estimate the position of each body part in advance. AI powered technology recognizes the data of certain action from the combination of each body part's position, which allows the quantification of physical load from the action using time-series data processing technology based on Deep Learning. 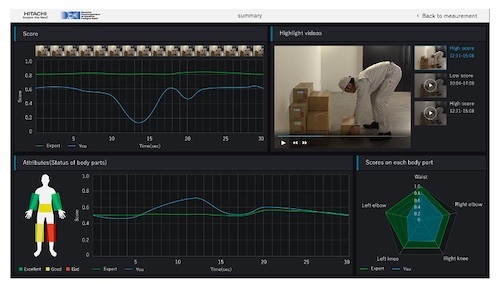 By automatically comparing the motion data of the model worker measured in advance and that of a worker for each body part, AI driven model identifies specific movements and body parts that account for significant differences between them. As a result, it indicates to the worker its assessment of body parts that are causing higher physical load in an easy manner. As an experiment, this AI based technology was applied to action to pick up heavy object. The results of the experiment confirmed that it can perform real-time estimation of quantitative values for the physical load of the action. In addition, for actions which contain bad movement, it was confirmed feedback on each body part could be provided, like movements of waist and knees are different from the model worker. Hitachi and DFKI plan to examine the effectiveness of giving instruction for safer operations in production sites with this technology. Hitachi and DFKI will utilize the newly developed AI driven technology for operation assistance and prevention of dangerous actions in order to contribute to ensuring workers' safety, managing workers' health, and improving worker education in various production sites. Also, even though this AI technology was originally developed for workers in manufacturing industry and in maintenance or carrier businesses as a technology to measure and evaluate the movement of a human body, it is also expected to be applied in other industries such as sports or entertainment in the future. Moreover, drawing on previously developed human activity recognition AI, Hitachi and DFKI will aim to realize more efficient and safer working environment by contributing to the improvement of productivity. (1) Suit-type wearable devices equipped with sensors. The German Research Center for Artificial Intelligence, with sites in Kaiserslautern, Saarbrucken, Bremen (with an associated branch in Osnabruck) and a project office in Berlin, is the leading German research institute in the field of innovative software technology. In the international scientific community, DFKI ranks among the most recognized "Centers of Excellence" and currently is the biggest research center worldwide in the area of Artificial Intelligence and its application in terms of number of employees and the volume of external funds. The financial budget in 2017 was 45,9 million Euro. DFKI projects cover the whole spectrum from application-oriented basic research to market- and client-oriented design of product functions. About 1000 employees from 60 countries are currently conducting research focusing on Smart Data & Knowledge Services, Cyber-Physical Systems, Multilingual Technologies, Plan-Based Robot Control, Educational Technology Lab, Interactive Textiles, Robotics, Innovative Retail, Information Systems, Embedded Intelligence, Smart Service Engineering, Intelligent Analytics for Massive Data, Intelligent Networks, Agents and Simulated Reality, Augmented Vision, Language Technology, Cognitive Assistants and Innovative Factory Systems. Impact: more than 130 professorships of former DFKI employees, and more than 90 spin-off companies with approximately 2,500 highly qualified jobs.